Bruce Jackson came from Sydney, Australia. In about 1971, when he was just 22, he became the sound engineer for Elvis Presley. Bruce revolutionised Elvis Presley's sound. He was the first person to put the speakers up off the ground, and fly them from scaffolding. After Elvis died in 1977 he then became Bruce Springsteen's front of house guy. A lot of the sound and techniques in common use today come from elements that Bruce Jackson developed. Raised in a castle overlooking Sydney Harbour, Bruce Jackson dropped out of university course in 1968 to build stroboscopes, amplifiers and colour-organs for the emerging psychedelic light show culture. Little did he know that in just three years he'd be on the road managing Elvis Presley's sound and poised to change forever how live concert sound was presented. In six years with the Elvis Presley Show Bruce established a close professional and personal bond with Elvis who trusted him implicitly to deliver the best sound possible. Bruce's inventions and technical advances were adopted by the entire live concert touring industry. Years of work have gone into making this book a fitting tribute. Bruce's first person narrative and contributions by friends and colleagues plus the eye-witness perspective of his brother Gary come together for an extraordinary insight. This is, incredibly, a new look at Elvis by someone who worked with him in a professional relationship that evolved into a personal friendship. Elvis came to respect Bruce Jackson as much as Bruce respected Elvis Presley. 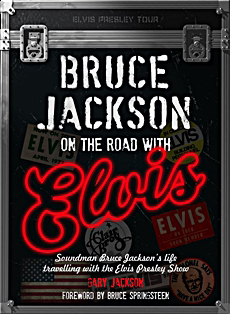 Finally a book from or bbout Bruce " Goose " About his life with Elvis.